An artist’s rendition of the Hongyanhe Nuclear Power Plant in Liaoning, China. Alstom is responsible to supply the AP1000 reactors for the HNPP. The installation of domes for phase 1 of the HNPP was completed in September 2011. Image courtesy of CNEC. L-3 MAPPS supplied the simulators for phase 1. 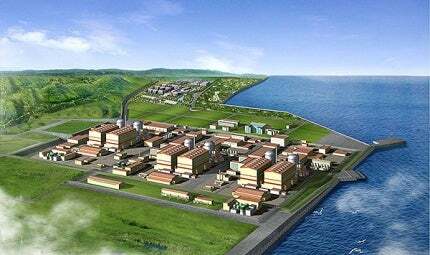 The Hongyanhe Nuclear Power Plant (HNPP) is located in Donggang Town, Wafangdian, in the Liaoning Province of China. The first unit of the plant was connected to the grid in February 2013, and commissioned in June 2013. HNPP is owned by Liaoning Hongyanhe Nuclear Power (LHNP), a joint venture of China Guangdong Nuclear Power Holding Company (CGNPC, 45%), China Power Investment Corporation (CPIC, 45%) and Dalian Construction Investment Group (10%). The Nyaganskaya GRES combined cycle gas turbine (CCGT) power plant is located in the Khanty-Mansi Autonomous District of Western Siberia, Russia. The plant comprising six units is being built in two phases. Construction of phase one commenced in August 2007, and phase two started in July 2010. The total cost of constructing phase one is estimated at CNY50bn ($8.2bn), and phase two CNY25bn ($4.01bn). Phase one is expected to generate approximately 30 billion kilowatts per hour of electricity annually, while phase two will generate 15 billion kilowatts per hour a year. Unit 2 of phase one was tested for criticality in October 2013, and connected to the grid the following month. Commercial operations for the other two units under phase one began in September 2016, while the remaining two units under phase two will come online in 2021. The Chinese nuclear power plant will comprise six CPR-1000 pressurised water reactors (PWRs) rated at 1,080MW each. CPR1000 is a three-loop PWR with double containment and core-catcher. Phase one is equipped with Alstom’s emergency diesel generators featuring 18PA6-B engines integrating Arabelle technology. The generators have an installed capacity of 6,300kW a unit. The other three units of phase one use the same. HNPP is the first Chinese power plant to use seawater desalination technology for providing coolant water. The Dizzer 5000plus ultrafiltration modules supplied by Inge Water technologies treat 26,000m³/d of water. Mitsubishi Electric, in association with its consortium partner China Techenergy Corporation (CTEC), is responsible to supply six MELTAC safety digital control systems (DCS) to the HNPP under a contract signed in July 2007. The digital instrumentation and control (I&C) system consists of a main control board which controls the entire plant operation, non-safety control cabinets, safety protection cabinets and related software in each cabinet. The plant will have a total of 180 cabinets. The HOLLiAS-N Distributed Control System (DCS) was installed at the first unit of HNPP. The control system was supplied by Hollysys Automation Technologies and was also installed in the remaining units of phase one. DCS is a control system which distributes controller elements throughout the system rather than centralising in a specific location. The subsystem of each component is controlled by one or more controllers. CGNPC was appointed as the engineering, procurement and construction (EPC) contractor for the project. China Nuclear Industry Huaxing Construction Company is carrying out the civil works while China Nuclear Industry 23 Construction Company is performing the installation works. CGNPC has also been contracted to operate the power plant for the first five years following the full commissioning of the plant. China Nuclear Power Engineering Company (CNPEC) supplied the nuclear reactors. AREVA supplied the fuel assembly components for phase one. The reactor pressure vessel (RPV) for unit 1 was supplied by China First Heavy Industries (CFHI). "HNPP is the first Chinese power plant to use seawater desalination technology for providing coolant water." Flowserve was awarded a $25m contract for providing concrete volute pumps for the Hongyanhe and Ningde Nuclear Power projects. The main boiler feed water pumps and associated boosters for HNPP are being supplied by Sulzer. Hongwei Supply Chain was contracted to deliver its expertise in supply chain management for HNPP. K1 and K3 type cables, for use both inside and outside the nuclear reactors, were developed and supplied by Prysmian. Ultra Electronics supplied the temperature sensors and switches for the reactors. Rolls-Royce is responsible for providing the reactor safety instrumentation and controls systems integrating rod control systems (RCS) and neutron instrumentation systems (NIS). Low-voltage switchgears supplied by ABB are also being used. L-3 MAPPS developed the simulators for phase one. Simulators for units 3 and 4 were supplied to LHNP in November 2010, and the simulators for units 1 and 2 were delivered in March 2011. AZZ is responsible for providing two circuits of 550kV 2000A gas insulated line (GIL) for the power plant. Kato Engineering designs and manufactures AC generators (alternators) for customer packaging with an engine or turbine. We also manufacture motor-generator sets for power conditioning or frequency conversion. We build quality alternators that are designed to withstand the test of time and extreme conditions. Thermo Electric Instrumentation designs and manufactures temperature sensors for turbines to a worldwide client-base in the energy industry.